Performance management continues to evolve rapidly. Sometimes when there’s so much change happening so quickly, it’s easy to lose track of just how far things have moved. 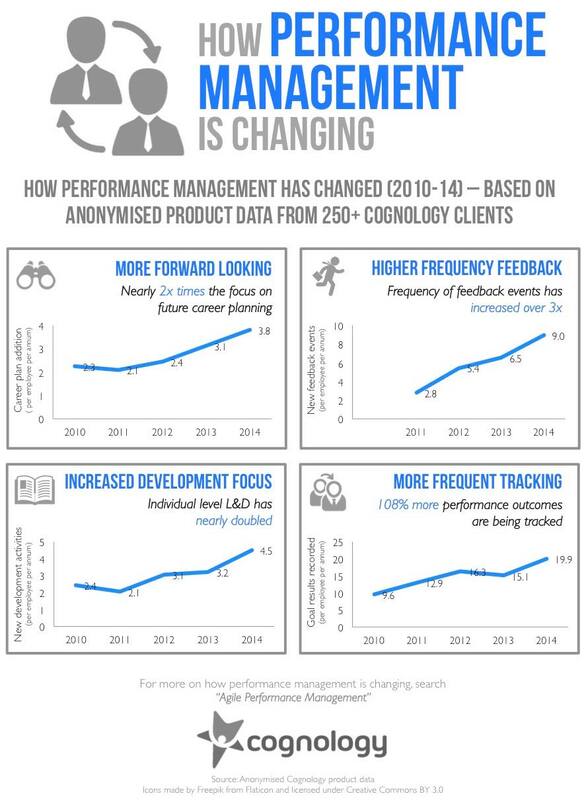 So this week, I’m taking the opportunity to dive into our anonymised Cognology product data to examine just how much performance management has changed over the past five years. Over the period from 2010-2014, the focus on employee career planning has nearly doubled. The data shows that the average employee is now adding four progression points into their career plan each year. Each addition defines things that an individual needs to do to take the next step in their career. As we see this number rise, it’s a sign that both managers and employees are more focused on performance management as a forward-looking activity. This is a very different style of performance management conversation. It’s all about the gap between where you are today and where you need to be tomorrow (rather than just focusing on your performance in the past period). The amount of feedback that employees can expect to receive each year has also significantly increased. For the average employee, the number of annual feedback events has risen from just under three in 2011 to nearly nine in 2014. That’s an increase of over 3x in four years! Spreading this feedback out across the year, this increase means that employees received feedback roughly every six weeks in 2014 (compared to once every four months in 2011). The power of frequent feedback is something I believe in passionately (and have talked about on many occasions, see here and here for two good examples). This dramatic increase in the amount of feedback received is a fantastic sign (but I’d still argue that once every six weeks isn’t quite enough for most employees). In any case, we’re certainly heading in the right direction. Over the past five years we’ve seen individual level L&D events nearly double. These events record things like individual training, learning, coaching and mentoring. Despite the current cost environment, we’re seeing more individual development happen now than ever before. It’s a great sign that executives clearly understand the ROI of a well-structured L&D program. The data also shows that we’re seeing much more frequent tracking of individual performance. In 2014, the average employee had 19.9 performance “results” recorded over the course of the year (up from 9.6 to five years earlier). In our performance management language, a “result” means that an outcome has been recorded against a performance goal. In English, this means that managers are tracking performance against goals and objectives at a much more frequent (and detailed) level. I know many people would argue this increased accountability is being driven by the current cost environment. My view is that this increase is also tied to the dramatic increase in the amount of feedback, with managers looking to inform better coaching and development planning. Fundamentally, it’s not possible to increase the amount of feedback by 3x without significantly more data! If you’re a regular reader of this blog, you’ll be familiar with my views on Agile Performance Management (performance management focused on highly frequent feedback and forward looking development). As the data here shows, it’s great to see that the market is naturally evolving towards a more agile version of performance management. I think it’s also powerful to absorb the fact that this performance management evolution is happening in a cost-conscious market. It reinforces that businesses aren’t making these changes because they’re a ‘nice to have’. They’re moving to more frequent, forward-looking performance management because they can see the hard economic logic. Better performance management makes more money. And that’s an easy business case for all of us to get behind.